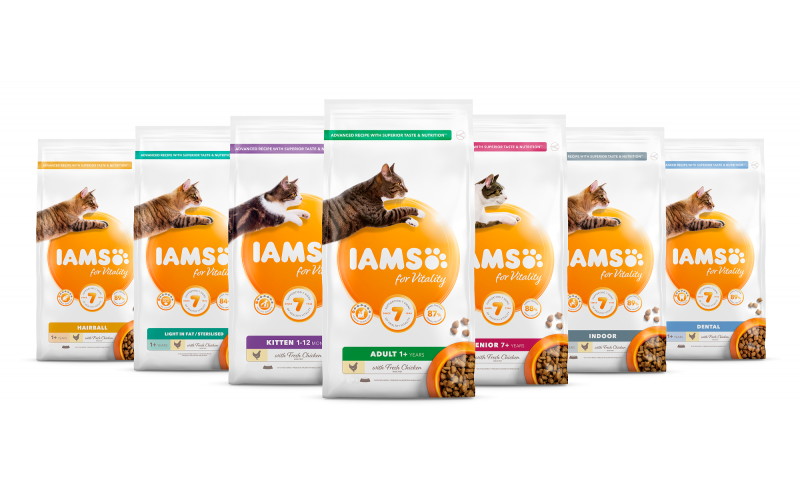 There’s nothing greater than seeing your cat looking healthy and enjoying life, which is why IAMS is offering 7 lucky winners the chance to get their paws on an 8 months’ supply of IAMS for Vitality Adult Cat food for their furry friend! IAMS recognises that cats have different nutritional needs, depending on their size and life stage. That’s why IAMS for Vitality provides a tailored life stage approach, supporting cats from kitten through to their senior years. With fresh chicken and a new, wheat-free recipe+, IAMS for Vitality offers a range of nutritional benefits, including up to 91% animal protein for cat*. It also combines the essential vitamins, minerals and nutrients needed to support the 7 signs of healthy vitality, including strong bones and teeth, a shiny coat, good digestive health and a healthy heart, for a happy, playful pet that looks and feels great whatever their life stage! Available in kitten, adult, senior, light in fat, indoor, hairball and dental varieties, IAMS for Vitality also offers a range of delicious recipes with meaty and fishy flavours that cats will love, to ensure they enjoy a diet that is mouth-wateringly tasty, leaving them purring for more.